O’Brian Lewis is a 17 year old with a background that spans as far as the hifel tower. 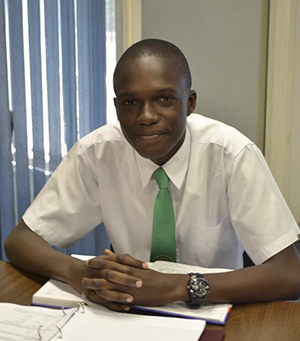 O’Brian, a past student of Oberlin High School, spent five years pursuing his secondary education, at the end of which he did 8 CSEC subjects. He did exceptionally well in these examinations and cupped several prizes at his graduation. He was then matriculated in the school’s sixth form, where he sat a few CAPE subjects. In O’Brian’s earlier years at his primary school he was the “Prime Minister”, a name his principal stuck to him after identifying his oratorical capacities. He is a well noted community member, known by most community members for his outstanding achievements in and out of the community. O’Brian is a motivator, and spends most of his spare time in the schools and churches as an ambassador for development. A very active youth politician and ideologist, he gives back to his country and family in any way possible. In the future, he seeks to occupy the ‘hot spot’ as Prime Minister of his country, pilot, and theologian. O’Brian also seeks to serve his Caribbean as an Ambassador for Youth Development in CARICOM. This young aspiring politician and leader, seeks to pursue studies in Social Work and Theology, as his Christian background is so well rooted that he has delved interest in this path. Most recently O’Brian has developed a relationship with Solo Caribe to promote one of his new burning interests; journalism. He has opted to serve the organization as an outbound journalist and writer. A job he is so proud to pursue. This young man seeks to serve you, himself, his country and family, sooner or later!